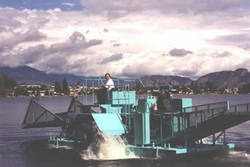 The OBWB has been responsible for Eurasian watermilfoil control in the Okanagan Basin since the 1970s. After many years of experimenting with different methods, the OBWB now focuses on harvesting in the summer and rototilling the root system on shallow portions of the lakefloor in the fall and winter. Learn more about milfoil control by viewing the videos below, or follow the links.